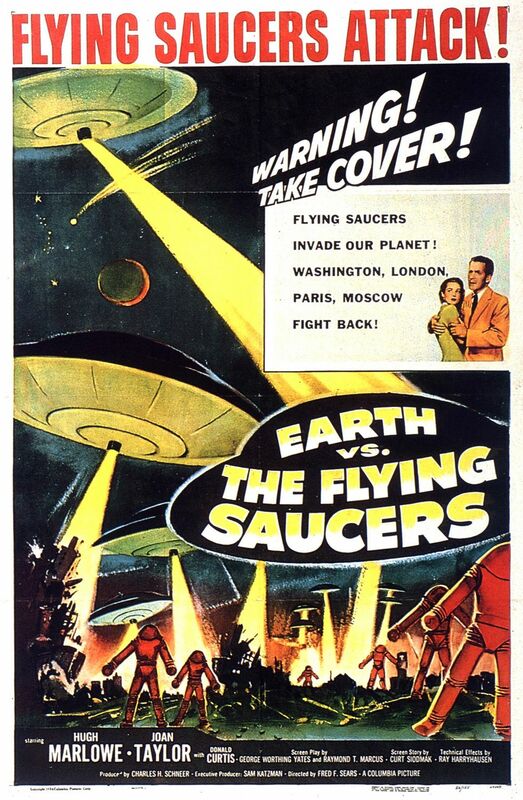 Earth vs the Flying Saucers. Clover Productions 1956. I’m closing the month with another sci-fi B-movie. I’m not sure how I first heard about this one, but I know it only by the title. It sounds like one Mystery Science Theater 3000 would have riffed, but they haven’t (at least, a cross-reference search only points to an episode for Earth vs. The Spider). It’s one of the B-Moviest of B-movie titles out there. Knowing nothing of the plot besides the title (which pretty much spells it all out), I can only assume that the pilots of those flying saucers are eventually shown, so this can count as a monster movie. This seems to be a safe assumption, since the poster appears to show menacing ground troops, but these are either spacesuits, mechs, or robots. Which are probably good enough. This isn’t in 3D, but I almost feel like I should wear red-blue glasses for it. Over the course of weeks, a dramatic uptick in flying saucer sightings have been seen around the world, which experts are trying very hard to believe is mass hallucination, but has the world militaries preparing for war against alien invasion. Dr. Russell Marvin and his new wife Carol are accosted on the way into the lab of science things by a saucer, which they’re hesitant to report even though they accidentally recorded the sound of it on tape. The Marvins work on Project Skyhook, sending probes into space to map the solar system in preparation for human travel, but General Hanley, Carol’s father, informs them that just about all of the probes have fallen back to Earth destroyed. When a saucer lands at Skyhook, the military guards open fire upon it, causing the saucer to respond by destroying the lab and killing everyone there except, conveniently, the Marvins, and abducting the General, tearing everything he knows out of his mind. Too late, Russell discovers a message for him in the saucer recording telling him the landing was a visit of peace to speak to him in person. Now that humans have taken the offensive, the extraterrestrials are demanding a summit with all world leaders in Washington DC in 56 days’ time to negotiate an occupation. With almost two months to prepare for an invasion, can there be any hope? The standout performance here doesn’t come from any of the actors, but from Ray Harryhousen’s modelwork. These saucers are no pie tins on fishing wire. The dated designs made me appreciate the work on the crumbling buildings more, but the animation on the saucers is still a beautiful thing modern methods would struggle to match. This is “suggested by” an allegedly nonfiction book about flying saucers, which partly explains why the aliens, their technology, and the counterinvasion are so much more realized than the characters, who just kind of walk through from point A to point Z without much characterization. That’s standard for B-movies though, so it shouldn’t bother me as much as it does. Maybe I’m holding it up to the animation’s standard. Making Russell and Carol newlyweds seems to be a fairly empty attempt to introduce human-scale stakes to a global story. It’s played as them just being married or a committed couple. The only impact of them starting mere hours after their nuptials is them casually mentioning to her father that they got married as soon as they see him, which is pretty much greeted with a harrumph that he missed it, and them finally getting on with their honeymoon once it’s all over. I don’t even see the point of Carol at all. She seems smart, and I think she’s a fellow scientist, but I don’t recall her contributing to the counterinvasion plans in any way. Neither is she really imperiled to raise Russell’s stakes. Everybody explains things to everyone else, so she’s not exactly an expository character. She’s just kind of there. It turns out I accidentally hit another seminal film to close out Movie Monster Month. This is more or less the first flying saucer film, launching a subgenre. Clearly what was good was great, and what wasn’t great didn’t matter.